Swig Equities, LLC has signed Situs Holdings, LLC to a new, 13,650 square foot lease for the entire 14th floor at 48 Wall Street in New York. The lease brings the building to 88 percent occupancy. Situs Holdings was represented by Cushman & Wakefield brokers Joseph Fabrizi and William Overlock in this lease transaction. The landlord was represented internally by Jonathan J. Dean of Swig Equities. 48 Wall Street is a 34-story, 324,000-square-foot office tower built in 1927. It was previously occupied by The Bank of New York. Swig Equities, LLC, in association with Kirkpatrick MacDonald of MacDonald & Cie, acquired the property and land in March of 1998, becoming the third owners of the property since the land was conveyed from the Dutch to the British and then to The Bank of New York in 1796. Other major tenants at 48 Wall Street include Rockefeller Center Business Centers, which leases 41,000 square feet, Conway, Farrell, Curtin & Kelly P.C., which occupies more than 17,000 square feet, and D.F. King, which occupies 26,000 square feet. Situs Holdings, a real estate advisory firm, has inked a lease for 13,650 square feet at 48 Wall Street, landlord Swig Equities said today. Situs will take the entire 14th floor of the 324,000-square-foot, 34-story office tower, located at the intersection of Wall and William streets. Industry sources said asking rents for the space were in the “high $30s” per square foot. global company,” said Jonathan Dean, director of commercial leasing for Swig Equities. Situs has another office at 150 East 52nd Street, at Lexington Avenue. The space at 48 Wall Street is their first Lower Manhattan office, and it will serve mostly new hires, a company representative said. This lease brings the tower’s occupancy rate to 88 percent, Swig said. Swig purchased 48 Wall Street in 1998, in a partnership with MacDonald & Cie, an investment bank. The building is home to the Museum of American Finance as well as Rockefeller Center Business Centers, an executive suite provider; Conway Farrell Curtin & Kelly P.C., a law firm and D.F. King, which provides investor communications services to public companies. Situs Holdings was represented by a Cushman & Wakefield team of Joseph Fabrizi and William Overlock, who were not immediately available for comment. The landlord was represented in-house by Jonathan Dean. NEW YORK CITY – Situs Holdings, LLC has taken space at 48 Wall Street and will occupy the entire 14th floor, reports Kent Swig of Swig Equities. 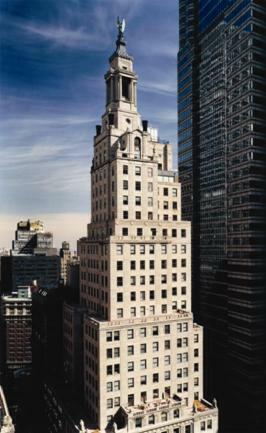 48 Wall Street, a 34-story, 324,000-sq.-ft. office tower built in 1927, was occupied by The Bank of New York until 1988. Swig Equities, in association with Kirkpatrick MacDonald of MacDonald & Cie, acquired the property and land that same year. They are the third owners of the property since the land was conveyed from the Dutch to the British and then to The Bank of New York in 1796. In this transaction, the landlord was represented by Jonathan J. Dean of Swig Equities, while Situs Holdings was represented by Cushman & Wakefield brokers Joseph Fabrizi and William Overlock.